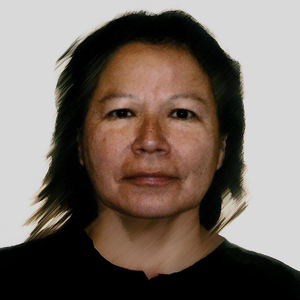 Shelley Niro is a member of Six Nations Reserve, Turtle Clan, Bay of Quinte Mohawk. Her aim is to abolish cultural stereotypes through poignant imagery which often includes references to the myths of Iroquoian tradition. At times she also includes a certain element of humour in her work. Shelley Niro holds an Honours degree in painting and sculpture and a Masters in Fine Art. Her work has been exhibited across Northern America, including the National Museum of the American Indian. She has received considerable recognition for her work as independent filmmaker, including screenings at the Venice Biennale and the Sundance Film Festival. “A certain Haudenosaunee story takes place before modern times. It predates mass communication, telephones or printing presses. The narrative is passed down through oral history, from one generation to another. The Haudenosaunee story of Skywoman has extended into pop culture. The set-up is this: A young beautiful pregnant woman lives in the nightsky constellation known as Pleiades. Sky People do not know illness. They live in a glowing shining world. Something happens in that world where people start to suffer from diseases which leads to their death. They don’t know what to do. They’ve never seen this before. Skywoman’s dying husband asks her to get him a drink of water from the forbidden Tree of Life. She doesn’t want to see him suffer anymore and makes the trip to the tree hoping it will heal him. As she arrives, a big gust of wind blows the tree over leaving a hole in the ground where it once stood. The wind knocks her into the hole making her try to grab the roots. In an attempt to grab onto something she grabs strawberry and tobacco plants instead. She begins her long lonely journey through darkness. In an act of love, Skywoman puts herself in danger, going against rules, society has set up to protect its community. In that one unselfish act she loses her way and ultimately everything. She floats through darkness for what seems like an endless amount of time. She doesn’t know where she is going or how long she will be in this state. Her fear eventually is overcome by curiosity. She begins to look forward to a new life with her unborn child, in a new and distant land. Monster is a story of women who live in this world. The depiction of Native Women in Canada is deplorable. Often stories are bleak and serves only one purpose, to perpetuate Native Women as losers and non-producers often taking away from the common good of this society. Newspapers occasionally make statements about the taxpayer’s loss as they are the ones paying for services going towards the livelihood of Native Peoples, notably women and their children. The attention and then the lack of attention for the Missing 500, the attention and then the lack of attention for the lack of good drinking water on Indian Reservations, the attention and then the lack of attention for glue sniffing children on Indian Reservations, North and South, the attention and then the lack of attention of suicide of Native Youth on any Indian Reservation propels any and all to register surprise and then denial. These stories are pulled and spread out for daily digestion depending on the political sway and often used as a divergent from the real issue. 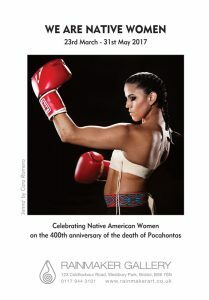 With this exhibition of images, my goal is to create another kind of image of Native North American Women. Our legacy starts in the skyworld. Through an act of accident, we are now inhabiting a world where we faced those everyday challenges and have found ways to thrive and survive. Occasionally I imagine how the story of Skywoman was first delivered. Was it a bedtime story? Was it at a biennial? A gathering of storytellers? May the best story win? This wasn’t a ordinary story about wolves in a forest or getting lost in a canoe. This was a story that took place in the stars above. The ability to eye the infinite firmament above, enriches the human soul indefinitely. I give thanks to my ancestors everyday. I connect with them through my own imagination. The forward thinking of invention and the inclusion of the universe makes being a part of this world doable and positive.